Founder Chris Lukenbill and his wife, Lisa, came up with the idea of Fresh with Edge in 2011. Their idea grew from a desire to know where their food came from. Neither Chris nor Lisa was raised on a farm, but both have a strong base of agricultural knowledge, gleaned from aunts and uncles. Both work in computer science, and used this skill to establish a successful aquaponics enterprise. Chris, a full-time web developer for the Mayo Clinic, devotes another 40 hours per week to Fresh with Edge. Lisa works full-time as well, and together they raise two young children. The Fresh with Edge journey hasn’t always been easy. In 2012 at an aquaponics conference, he met with Nate Storey of ZipGrow Towers, who offered counsel and proved to be a valuable guide. Shortly after, a local food co-op gave Chris and Lisa an opportunity to sell herbs and greens onsite from their vertical towers. This led to more opportunities. 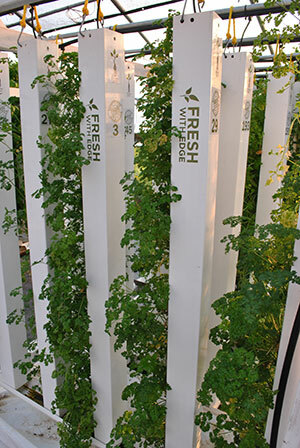 Now, Fresh with Edge vertical towers, bursting with herbs and greens, may be found at two Rochester area restaurants: Tonic, in the Midtown district; and Rainbow Café in Pine Island. “The towers help restaurant customers make connections with their food,” Chris says. Fresh with Edge used to sell at the farmers’ market in Rochester, which, according to Chris, provided great networking opportunities. Now, Fresh with Edge is taking a break from the farmers’ market to pursue other avenues. One such pursuit is in-home sales, which allows individuals to purchase their very own vertical tower with fully-grown herbs and greens, including lettuce, bok choy, kale and chard. The in-home towers are still “live”, with a working base and pumps and optional nutrients to purchase (advised if the system is run for at least one week before harvesting). And at People’s Food Co-op, Fresh with Edge sells produce by the ounce. Chris says that his company is pretty much breaking even each month, with slight improvements. “We’re just starting to break into the black,” he says. Presently, Fresh with Edge has 300 towers in its facilities. Chris would like to expand the market opportunities for Fresh with Edge by focusing on producing local, healthy and nutritious food. While Fresh with Edge does not advertise, Chris says the business is becoming better-known in the Rochester area. It also has a strong social media presence. Possible future plans include a partnership that will enable Fresh with Edge to use waste heat from electricity production to heat its greenhouse. This, he says, will allow year-round food production. Currently, the Fresh with Edge growing season is April to early November, since its greenhouse is not heated. “There is lots of opportunity for more growth,” Chris says.